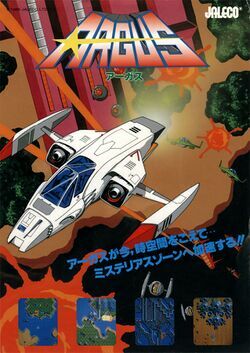 Argus is a 1986 arcade game developed by Jaleco While it borrows heavily from the game which established the vertically scrolling shooter, Xevious, it adds its own unique twists. The player's ship is always presented in the center of the screen, and as the player moves left and right, the ground actually scrolls in the opposite direction. The player can continue scrolling all the way in one direction and end up back where he or she started. Other new concepts include walls of mazes that float in the air which may be optionally traveled through. Certain ground targets provide power-ups or special weapons, but they must be bombed three times in order to earn them. A boss sequence occurs at the end of each stage. 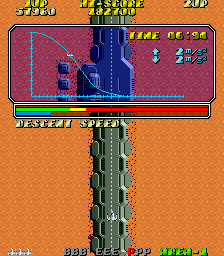 The boss has one infrequently exposed weak spot that only takes one bomb to destroy, but the boss will leave after an alloted time if the player does not succeed. There is a landing sequence after the boss fight that must be successfully maneuvered for bonus points. 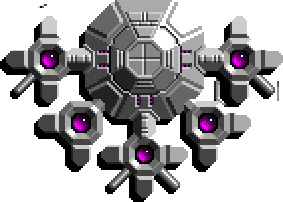 And finally, the ship receives a new weapons at each stage (5 distinct combinations which cycle). The arcade game features 16 levels, the last four of which repeat indefinitely. The arcade game was not released much outside of Japan. Jaleco ported the game to the Famicom in the same year as the arcade's release. While similar to the arcade, it was simplified a great deal (there are only two different weapon combinations which cycle back and forth each stage), and a common criticism is the noticeable lack of colors in comparison to the arcade. The Famicom version also contains nine levels that cycle from the beginning forever. The game was also included in the Jaleco Collection Vol. 1, released in Japan for the PlayStation in 2003. Joystick: Press the joystick in any one of 8 directions to control the flight of your ship. As stated above, while you will notice a change in your ships position on the screen vertically, you will not notice one horizontally. Instead, the ground will scroll beneath your ship in the opposite direction. Shoot: Press the fire button to fire a bullet, beam, or laser (arcade only) at airborne enemies and tiles. Bomb: Press the bomb button to fire an air-to-ground bomb or laser (arcade only) at ground based targets, including power up tiles. If you hold down the bomb button while you have lasers, you can wear the laser out, preventing yourself from using it until the end of the round. With the single exception of the L tile, you must collect three of any of the following tiles to gain the benefit of their power. Barrier Hit three B tiles to enable a barrier that temporarily shields you from any attack. You can crash through enemies and bullets without harm. Watch closely to see when the Barrier is beginning to wear off. You will be vulnerable again as soon as it's gone. Enemy Crash Hit three E tiles to collect an Enemy Crash. Once you do, the Mine will appear in front of your ship. You may collect it at any time. When you touch it, every enemy present on the screen at that time will explode, and you will get 1000 bonus points for every enemy destroyed. Not present in the Famicom version. Power-Up Hit three P tiles to collect a Power Up. When you do, your primary air-to-air weapon will be upgraded (either doubled in firepower, or increased in size.) This power-up will last for the extent of your current life, even if you pass on to a new stage and receive a new weapon. Landing Bonus Shoot down as many L tiles as you are able to, in order to collect a bonus at the end of the stage for a successful landing. Every stage ends in a battle against a boss. You will face multiple threats while attempting to bomb a single point on the enemy craft. Ground cannons will fire at you, and enemy ships will fly all around you. The cannons can be eliminated, on both the ground and the boss craft itself, but the enemies will continue to fly around you. The only point that can bring the boss craft down is a point in the back of the center of the craft that is only exposed for brief periods at a time. To succeed in defeating the boss, you must bomb this location when the point is exposed. If you don't hit it in time, the boss will leave. The bosses get gradually harder from one stage to the next. After the boss fight, whether you succeed in beating it or not, you end each level with a landing sequence. You must approach a runway. When you are close enough to it, the landing sequence will initiate. You must press up to dive, and down to climb. The idea is to watch the bars at the bottom of the graph. You are only safe to land as long as the blue bar which represents your altitude is in the yellow. If it is in the green, you will remain off the ground. If it is in the red, you will crash land. You will only receive an L tile bonus is you land safely. The number of L tiles you collected are multiplied by the remaining amount of time that you had for the landing. The Famicom version is a little harder since you don't have the benefit of the bars. As mentioned before, there is a much smaller variety of weapons. The air-to-air weapon is a bullet (which upgrades to a triple shot) on odd stages, and a three-way beam (that upgrades to double shots) on even stage. The side shots in the three-way beam ricochet off of maze walls. In addition, in certain sections of the game, a shadow of another ship besides your own can be seen warping from one location to another. If you match the location of your shadow with the shadow that can be seen, your ship will transform into an invincible robot. Not only can the robot to destroy all enemies that it runs into, it tractors all of the enemies into a straight line in front of it. The landing sequence is missing the guidance bars, so you have to rely on the graph to monitor your trajectory. This page was last edited on 20 March 2010, at 05:56.